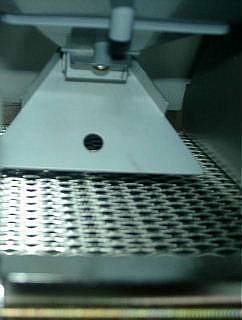 The stone pulling out machine of the type according to the swing selection by specific gravity moves to the above when rice is dropped on the inclined net, and the entire net is shaken the thing with large specific gravity (stone and sand) and can select a small stone (sand grain) and rice. I am ..(of winnowing in childhood.. principle that looks like that well though I selected grain by using the one named seeing). When it ate the rice of cleaned rice, will you have bitten [gari] and the stone?This is because a small stone has mixed with cleaned rice. The rice before mother boiled meal was separated in old times and a small stone was separated by polishing and using the difference of the specific gravity at [gu] stage so that there was not this. There was a convenient stone pulling out machine , and it came to be able to select a small stone easily from among the large store of rice now. It is what became convenient. In my home, a small stone had occasionally mixed with the rice that had been harvested it was years how many though there was no small stone (bit of grit) in rice for years how many. The stone pulling out machine of the type according to the swing selection by specific gravity was bought in 2004 because it was a trust problem because it sold rice. And, it stores it by the paddy pickpocket's being pull out the stone later soon and processing it. The stone pulling out method of the stone pulling out machine includes the method and the color selection method according to the swing selection by specific gravity. In general, it is a method according to the swing selection by specific gravity that it is widespread. The price is very expensive though the color selection method can remove not only a small stone but also various things. A small stone with large specific gravity etc. move to the above in the method according to the swing selection by specific gravity when rice is dropped on the inclined net, and the entire net is shaken, and rice moves below. Thus, a small stone (bit of grit) is selected. Because the structure is easy, the method according to the swing selection by specific gravity is adopted in a cheap stone pulling out machine well. A small stone can be roughly pulled out though the performance is not complete. Especially, a small stone disappears almost completely if it passes it twice when there are a lot of small stones. This side of this photograph is the upper part, and the interior is the lower side. Rice falls from the upper part of the photograph. The net under this swings (vibration). A color sorter blows off in air detecting stinkbug damage rice, coloring rice, a small stone (bit of grit), and the paddy and other foreign bodies and rejects inferior products from among cleaned rice and the brown rice. Not only a small stone but also various foreign bodies can be removed. However, the price is very expensive. How to use of the stone pulling out machine. Setting up about the stand that is steady of the stone pulling out machine. The shutter at the entrance of rice is closed. The part where a rear small stone is taken out also closes. The container such as one-'to' cans is set up at the exit of rice. The lid above is taken and rice cleaning or the brown rice is put on. About 15kg can be put at a time. After it turns the power switch on, the shutter at the entrance of rice is opened. It is confirmed that the selected rice enters the container well. When the selection ends, it draws a shutter and it turns off power. The one that it turns the power switch on whenever , 30-60kg is selected at the time of use it every time, the taking out mouth of a small stone in the back is opened, and a small stone and rice mixed is taken out. This amount is a little, and in my home, this is selected by eyes and it makes it to for food because it is too good. Whenever using it every time, the cleaning and the check of each part are done. Especially, let's often check before it uses it. The stone pulling out machine is horizontally set up in [gata]. Because the horizontal of the equipment influences the performance, it is very important. 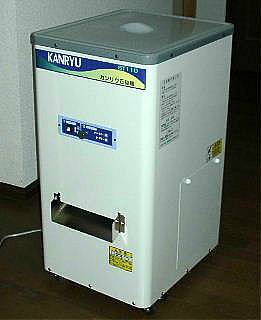 The stone pulling out machine prevents rice from remaining internally cleaning each part after use. Especially, the thing that a small stone and rice in the back mix is put out and it does for remembrance' sake. If rice is left internally, the maize weevil (rice weevil) boils, and the rat enters.